In Hall 3C / Stand 428, E-T-A will be exhibiting its latest products at this year's SPS IPC Drives show. The company will provide you with information on overcurrent protection, power distribution and system solutions. 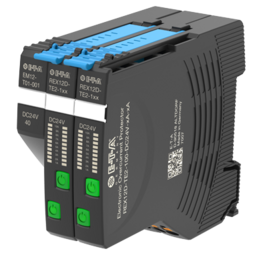 The REX12 compact and flexible protection system is E-T-A’s suitable solution for protection and distribution in DC24V systems of machine and panel builders. E-T-A’s new REX12D-TE2 electronic overcurrent protection combines unrivalled flexibility, enabled by adjustable current ratings from 1-10A with a slim design of only 6.25mm per channel. Parameterisation of the current ratings is easily done via IO link or Modbus RTU and can be adjusted with a button directly on the device. As with all other REX12 devices, no further accessories are required. Ease of mounting and minimised wiring time help save time and money. The REX-Quat-Pack, a four-channel combination consisting of one EM12-T supply module and two REX12D-TE2 electronic circuit protectors, does not only save space in the control cabinet, but also cuts storage efforts because only one part number is required for 4 channels. 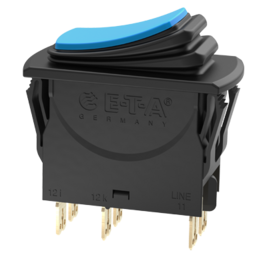 E-T-A’s 3120 works as an ON/OFF switch in devices and machines and it also provides reliable disconnection in the event of an overcurrent. The new seal provides IP65 protection degree. Even fine dust or water jets will not damage the device or cause failure to the equipment where it is used.